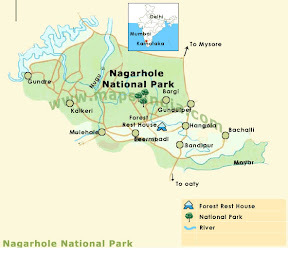 The name Nagarhole is derived from the Kannada words 'Naga' meaning 'snake' and 'Hole' meaning 'streams'. 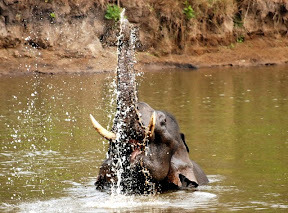 A number of streams snake through the rich tropical forests of Nagarhole which is situated at Karapur in the picturesque districts of Kodagu and Mysore in Southern Karnataka. 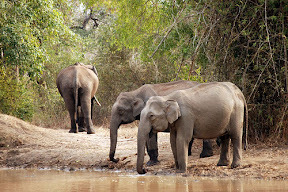 The Nagarhole National Park was first constituted in 1955 and later enlarged in 1975 to include more expanses of reserve forests. Once an exclusive hunting preserve of the erstwhile rulers of Mysore, it is an ideal habitat for a wide variety of wildlife. Forest Types : Southern tropical semi-evergreen forests, Southern tropical dry deciduous forests, Southern tropical moist mixed deciduous forests, Scrub forests and Lush, green, grassy swamps. : Animals : Four horned antelope, sloth bear, civet cat, barking deer, mouse deer, spotted deer, wild dog, elephant, jackal, common langur, slender loris, bonnet macaque, common mongoose, small Indian mongoose, striped necked mongoose, otter, pangolin, panther, wild pig, porcupine, sambhar, giant squirrel, flying squirrel, malabar squirrel, three striped palm squirrel and tiger. Birds : Pea fowl, common babbler, scinaitar babbler, bea eater, red whiskered bulbul, red vented bubul, little brown dove, ring dove, spotted dove, crested hawk eagle, crested serpent eagle, tawny eagle, Malabar pied hornbill, malabar grey hornbill, loriekeet, minivet, blyth's myna, Alexandrine parakeet, blue winged parakeet, blossom-headed and rose ringed parakeets, southern treepie, green imperial pigeon, adjutant stork, great Indian Warbler, reed warbler, wood peckers, etc. Reptiles : Common cobra, marsh crocodile (in Kabini river) Krait, Monitor Lizard, rock python, Indian python, bamboo viper, pet viper, Russell's viper, several species of gecko, skink and agamid lizards, etc. Madikeri (93 Km. ): Perched at an altitude of 1170 metres, Madikeri is the headquarters of the Kodagu District, which is famous for its coffee and orange plantations and its enchanting natural beauty. Mysore (96 Km. ): Mysore reflects the lavish ways of the Maharajas in the numerous palaces, parks and boulevards of the city. Bandipur National Park (100 Km. 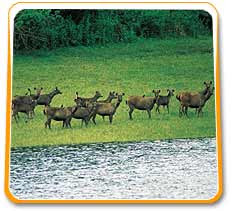 ): Located on the border of Karnataka with Tamilnadu, this park has a wide variety of wildlife to enthral the visitor. Area : 572.90 Sq.Km. Altitude : 800 to 850 metres. Temperature : Max: 33 Deg.C. Min: 14 Deg.C. Rainfall : 1300 to 1800 mm. (June to Sept) Season : Sept. to May. Air : The convenient airport, Bangalore (236 Km. ), is connected by Indian Airlines and Private Airlines with major cities in India. : Mumbai - Bangalore : Rs. 4640/- (Y) ; Rs. 6640/- (J). Rail : The nearest railway station is Mysore (96 Km.) connected with Arsikere, Bangalore and Hassan. Road: Motorable roads connect Nagarhole with Bangalore 236 Km. 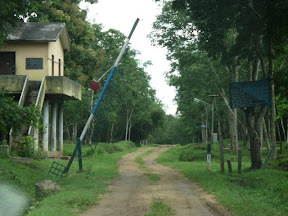 via Mysore, Madikere 93 Km. via Virajpet & Kutta and Mysore 96 Km. via Hunsur. There are bus services to Nagarhole from Hunsur, Madikere and Mysore. 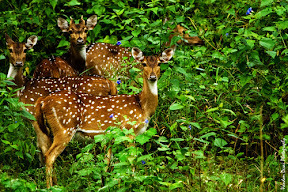 The Forest Department arranges for wildlife viewing around the park by mini bus, vans and jeeps. All tours are accompanied by trained forest guides. Timings : 0600 hrs. to 0900 hrs. and 1600 hrs. to 1800 hrs. Visitors vehicles are permitted to the park only when accompanied by trained guides on payment of prescribed fees. Reservations : Range Forest Officer, Nagarhole National Park, Kutta. Tel : (08274) 44221. Resvns:Jungle Lodges and Resorts Ltd., Shrungar Shopping Centre, M.G.Road, Bangalore - 560 001. Tel : 5597021, Fax : 5586163. Cauvery Lodge Rs.1000/- per room. Dormitory (12 bedded) Rs. 600/-. 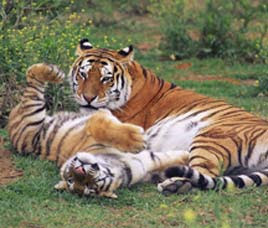 Reservations : Chief Wildlife Wardern, Aranya Bhavan, 18th Cross, Malleswaram, Bangalore 560 003, Tel: 3341993. OR Range Forest Officer, Nagarhole National Park, Kutta. Tel : (08274) 44221.